In the course of his extraordinary travels, Gulliver is captured by miniature people who wage war on each other because of a religious disagreement over how to crack eggs, is ill-treated by giants, visits a floating island, and decides that the society of horses is better than that of his fellow men. 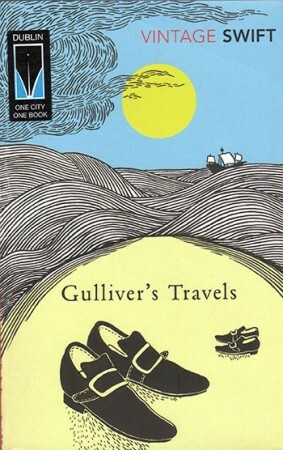 Gulliver’s Travels was written in the style of a contemporary travel book over 250 years ago by Jonathan Swift, Dean of St. Patrick’s Cathedral in Dublin. It is at once a moral tale, and one of the greatest pieces of satirical writing in the English language. Like all true classics, it is still a work that has much to say about the human condition. Jonathan Swift was born on 30 November 1667 in Dublin, and educated at Trinity College and Oxford University. After working for a time as secretary to Sir William Temple in England, Swift was ordained as a priest of the Church of Ireland and returned to Dublin in 1694. In 1713 he became Dean of St. Patrick’s Cathedral. The first of his major satirical works, A Tale of a Tub, was published in 1704 and through his writing he became friends with the poet Alexander Pope. Together with other writers, they founded a literary group called the Martinus Scriblerus Club in 1714. Gulliver’s Travels (1726) is the only book for which he received any money and he never wrote under his own name. He died on 19 October 1745 and is buried in St. Patrick’s Cathedral.